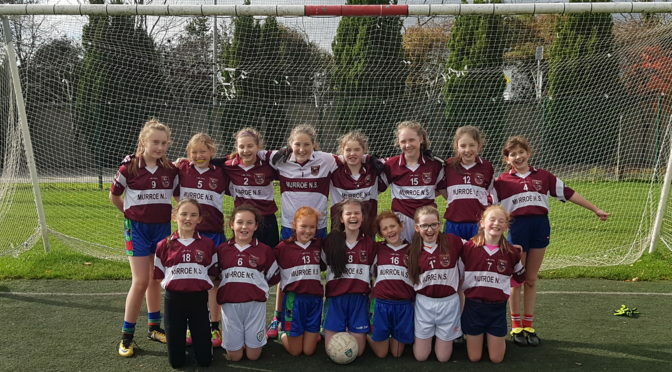 Congratulations to the Girls’ Football team who qualified for the 7- a side County Final after winning their blitz which was played in Doon on Tuesday. The girls played brilliantly and showed great skill and character during all their games. The girls defeated Oola, Caherconlish and Cappamore and now look forward to the final in the Gaelic Grounds on Monday the 22nd of October. Best of luck to all involved. Panel: Sarah Nicholas, Laura Flynn, Eve Shanahan, Rebecca Ryan, Sinéad Cusack, Aoife Dunlea, Asha Slattery, Julia Bubula, Hailey Martin, Amber O’ Brien, Lauren Cusack, Jenna Johnson, Maebh Callanan, Rachel Kemp and Aleesha Drew. Teacher- Mr. Neville.